Dear Joseph–I am delighted to be able to write you this letter and send this enclosure. Listen: On September 12 (the Schumanns’ wedding-day) a letter came from the doctor at Bonn, in which he said Herr Schumann had expressed to him the fear that his wife must be dead, as he had had no letter from her. In this letter of the 12th the doctor asked Frau Schumann to write a few lines to her husband. She wrote two letters; in one she mentioned the dates (12th and 13th), in the other she did not. But Herr Schumann told the doctor quite of his own accord of the great importance he attached to those two dates. So they gave him the first letter. At mid-day on the 15th a letter came from the doctor with enclosures. I handed it to Frau Schumann in fear and trembling! I cannot read the last sentence of his letter (“so many questions”) often enough; it is the best proof of what I believe to be the case, that he is only ill now through fear and imagination. He is afraid of asking irrational questions, and begs her, in that case, to draw a veil over them! 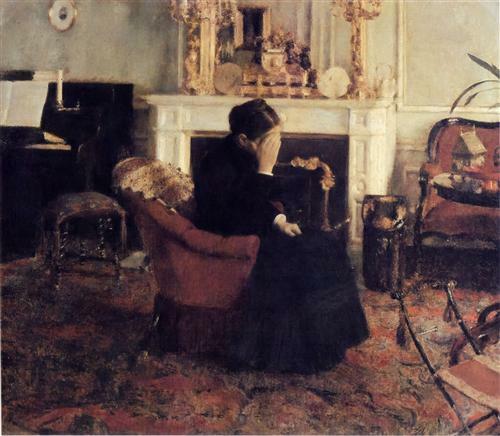 The doctor tells her he read her letter frequently during the day, and wept with emotion. As the doctor gave her permission to answer his questions, and send him what he asked for, she did so the same day. 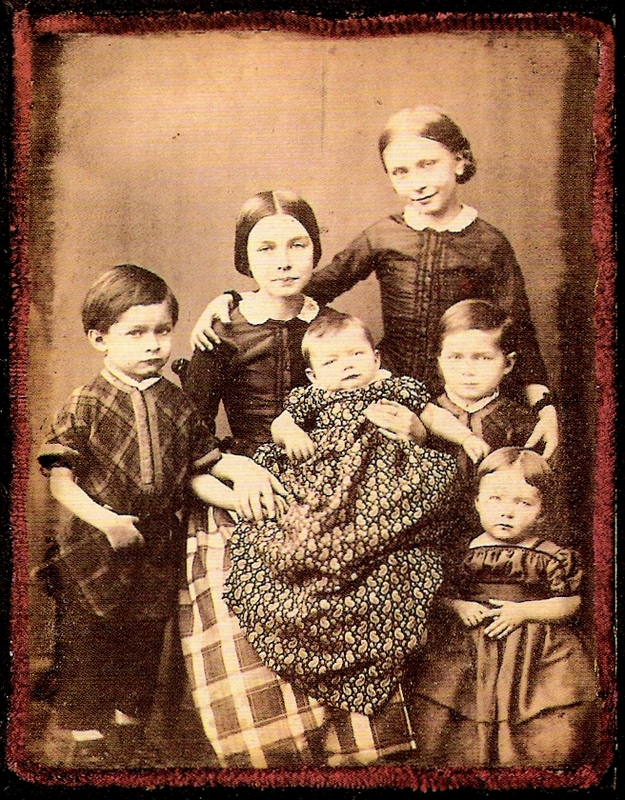 Six of Robert and Clara’s eight children, including baby Felix in the center, 1854. My dear Friend–I cannot keep to myself that which, I know, will give you the greatest delight! It is a greeting to you, dear Joachim, from my dearest Robert….And so a joy has come to me for which I hardly dared to hope a fortnight ago, and yet, believe me, it is terribly hard to bear it! I should like to pour my heart out to him, to be able to tell him how he alone occupies all my thoughts and feelings, and yet I have to be careful in my letters, I must control the mighty beating of my heart and suppress so much! He says nothing about my going to him at present. I imagine the doctors are still against it, and he readily agrees to everything they tell him. And so, in spite of all the promising symptoms, he will make very slow progress, and I am quite resigned to that! I only pray God He may give me the strength to endure the terrible agitations which I have again experienced, and which lie before me in the future. My old friend, my piano, must help me in this! Oh, dear Joachim, I thought I knew what a splendid thing it is to be an artist, but I only realise it for the first time now that I can turn all my suffering and joy into divine music, so that I often feel quite happy! 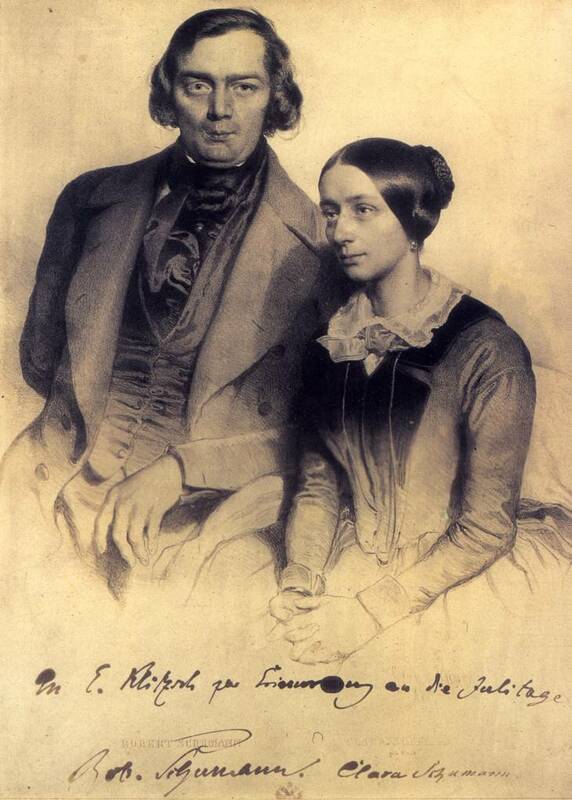 Eduard Kaiser, Robert and Clara Schumann 1847. What a thought, to see him, the most zealous of artists, mentally weakened, perhaps, or far more likely, prey to the most terrible melancholy! Do I want to have him like this? And yet, should I not want to have, most of all, the person back again? Oh, I don’t know what to think any more; I have thought it all over thousands upon thousands of times, and it always remains just terrible. 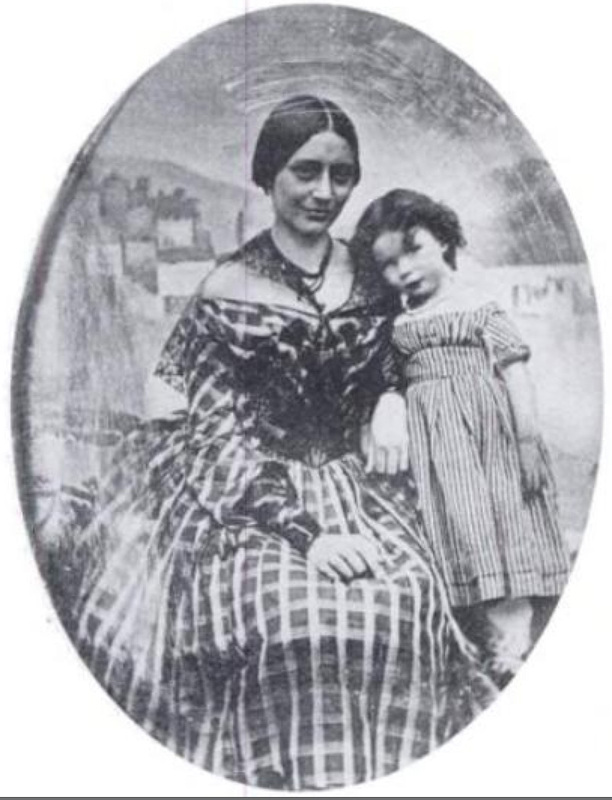 Clara and Marie Schumann (the Schumanns’ firstborn), 1844. I stood at the body of my dearly loved husband was calm; all my feelings were of thankfulness to God that he was finally free, and as I knelt at his bed I had such a holy feeling. It was as if his magnificent spirit hovered above me, oh–if he had only taken me with him! I saw him today for the last time–I placed some flowers on his brow–he has taken my love with him!